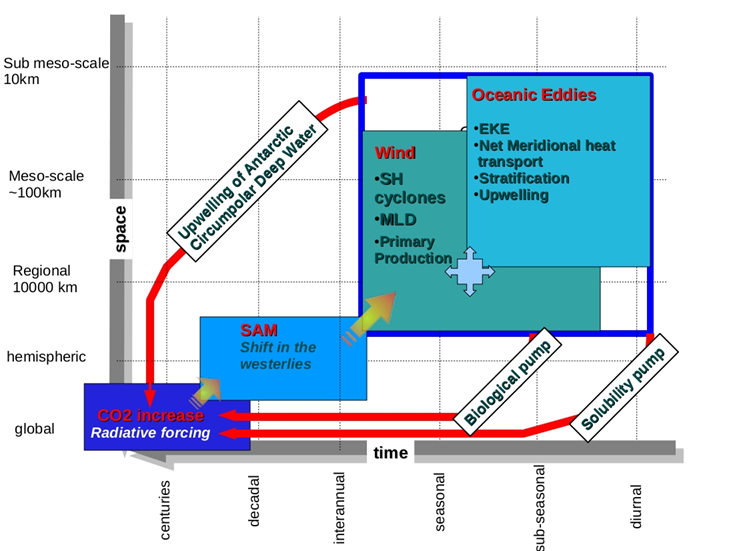 Fig.1: Depicts the SOCCO scale-centred approach which hypothesises that in order to understand and predict the century scale evolution CO2 and its radiative and ocean acidification forcing it is necessary to understand and correctly parametrize the processes inside the seasonal – sub-seasonal and meso and sub-mesoscale “window”. This scale sensitivity links to the CO2 through the feedback of the upwelling of CO2 rich water, the biological pump and the solubility pump. SOCCO takes an inter-disciplinary approach to understanding and projecting the Carbon – Climate links in the Southern Ocean. 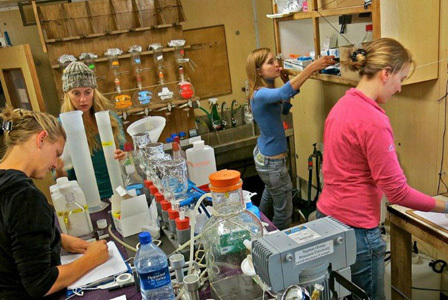 It comprises research groups with focus on dynamics of upper ocean physics, ocean CO2 and oxygen, ocean productivity and carbon export, Iron and nutrient biogeochemistry. Our approach involves a combination of long term observations linked to regular voyages of the SA Agulhas II to the Southern Ocean, Seasonal Cycle Experiments and high resolution modelling. More recently we are also introducing the use of robotics into both the long term observations and the experimental approaches. The global carbon cycle comprises two parts: firstly, the human derived (anthropogenic) flux of about 8 PgCy-1of which the oceans take up about 2 PgCy-1, and the Southern Ocean contributes about 1PgCy-1. Secondly, a very much larger but up to now balanced ocean – atmosphere exchange of natural CO2 of approximately 90GtCy-1. The steady-state magnitudes of the anthropogenic and natural CO2 fluxes are robustly constrained by the global and regional decadal mean data sets. The science gap lies in the non-steady-state part of these fluxes: both in terms of variability and long-term trends. SOCCO research is focused on understanding and quantifying the non-steady state part of the CO2 variability and trends. Century-scale trends in atmospheric and ocean CO2 face a dual problem which impacts on global and regional scale mitigation of CO2 emissions to limit climate change risk: not only will the uptake rate of anthropogenic CO2 decrease because of changing CO2 chemistry (Ocean Acidification) and warming but as importantly, climate forcing will begin to alter the ocean physics that controls the much larger natural CO2 flux in the Southern Ocean. 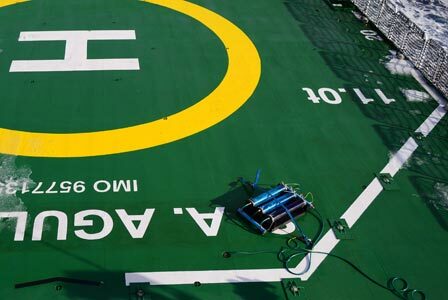 It has established a long-term ship –based CO2 observations system making underway observations in the southeast Atlantic Ocean and the southwest Indian Ocean (Fig. 1). These data are made available to the national (SADCO) and global (CDIAC) databases from where they are then integrated after 2nd level QC into the SOCAT and later ocean acidification databases. Through this SOCCO builds up a data set, which includes a wide range of ancillary variables, to support its own research as well as global community initiatives. 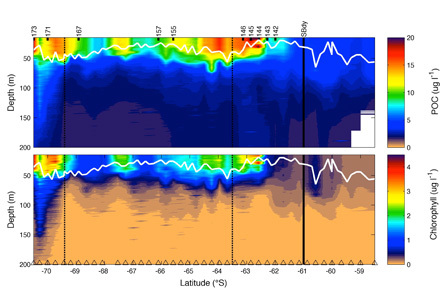 As part of its scientific focus on fine scale ocean dynamics the CO2 research makes a strong contribution to dedicated experiments which aim to understand the sensitivity of the carbon cycle in and CO2 fluxes to the seasonal and intraseasonal dynamics of upper ocean physics (meso and sub-mesoscale). 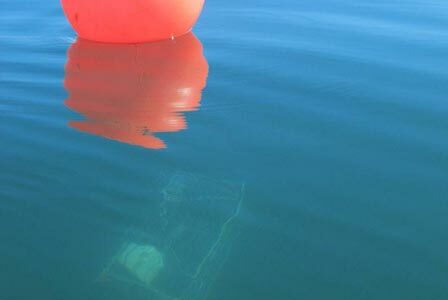 In this domain we are exploring the use of robotics (surface wave gliders and ocean interior buoyancy gliders) to make observations within these spatial and temporal scale constraints. 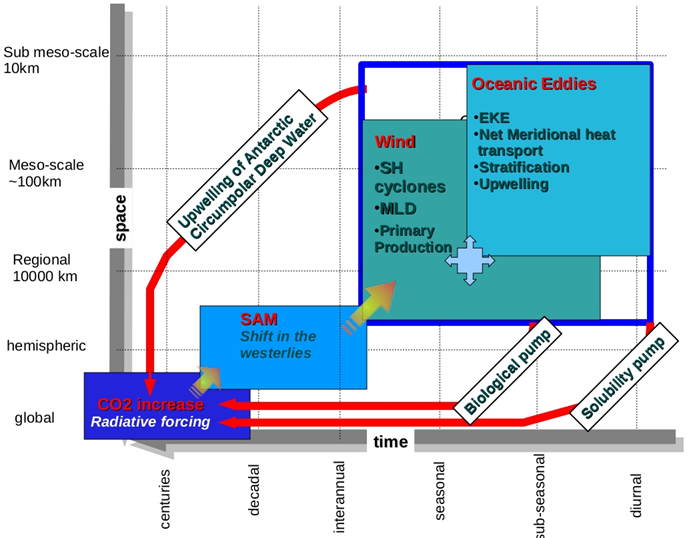 The Southern Ocean Seasonal Cycle Experiment (SOSCEx) is our platform for these experiments, which target the core hypothesis of the programme: fine scale (carbon) – large scale (climate) links. Modelling: in SOCCO we undertake CO2 modelling research in two main areas: firstly, we explore the use of different empirical numerical / machine learning methods to address the need for high precision (< 0.1PgCy-1) CO2 air – sea exchange fluxes in a data sparse system. This part of a global effort to reduce the global uncertainty of CO2 fluxes to ~10% of the mean annual flux necessary to resolve inter-annual variability and long-term trends. Secondly, we use a hierarchy of global and regional coarse (200km) to very high resolution (2km) model runs to test both scale sensitivity research questions for CO2 and the carbon cycle as well as explore the understanding and use of the seasonal cycle as a mode that provides a rigorous test to model outputs. For the iron chemistry project, seawater samples are collected during our annual relief voyages to Antarctica on board RV Agulhas II. A GEOTRACES trace metal clean 24 x 12L GoFlo carousel and Kevlar cable winch (Figure 1) is used to collect seawater along a vertical profile. 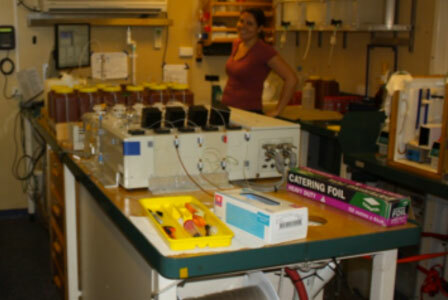 Subsampling is conducted inside a certified trace metal clean container lab equipped with circulating HEPA filters for clean air supply (Figures 2 and 3). Concentrations for total dissolvable Fe (TDFe, unfiltered), dissolved Fe (DFe, filtered through 0.22 µm) and soluble Fe (SFe, filtered through 0.02µm) are measured using a Flow Injection Analyser (FIA; Figures 3 and 4) with chemiluminescence detection inside a trace metal clean class 100 laboratory at Stellenbosch University. 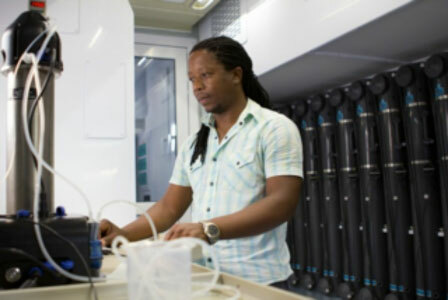 An ICP-MS is also available at Stellenbosch University. Ocean colour remote sensing can provide routine, synoptic and highly cost-effective observations of biological and biogeochemical response to physical drivers across oceanic ecosystems, over decadal time scales and at high frequency. In many cases, remotely sensed data are the only systematic observations available for chronically under-sampled marine systems (e.g. the polar oceans), and there is thus a need to maximise the value of these observations by developing ecosystem-appropriate, well characterised products. 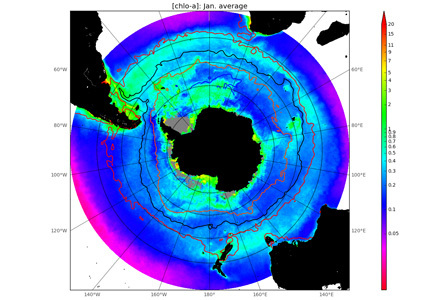 A primary focus of SOCCO’s bio-optical research is on gathering the necessary bio-optical and physiological data to develop and validate appropriate regional ocean colour algorithms for the Southern Ocean. 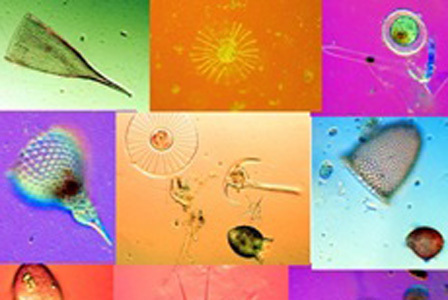 This includes bio-optical data in the form of Inherent Optical Properties (IOP’s) (scattering, beam attenuation and absorption) and Apparent Optical Properties (AOP) (radiance, irradiance, reflectance, diffuse attenuation coefficient) and biogeochemical data that characterises the phytoplankton community (e.g. carbon content, size structure and dominant functional type). This information in conjunction with radiative transfer models and reflectance inversion algorithms will allow us to use satellite derived ocean colour data to investigate biological responses (through changes in biomass, community structure and physiology) to event, seasonal and inter-annual variability in ecosystem physical drivers at the required spatial and temporal scales. Given the important relationship between community size and carbon export these approaches will allow us to assess the potential for carbon cycling and carbon sequestration at the regional scale. 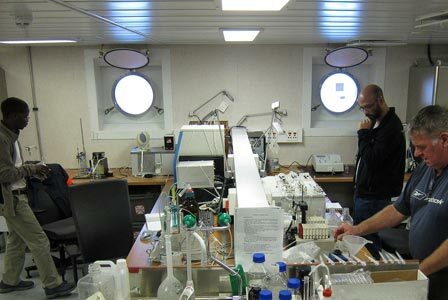 Scientists on the SA Agulhas collecting biogeochemical data to characterise the phytoplankton community structure. Spatial distribution of mean chlorophyll concentrations for the Southern Ocean south of 30oS for Summer (January) taken from SeaWiFS ocean colour data. Frontal positions calculated from MADT contours are shown for the STF (red), the SAF (black), the PF (orange) and the SACCF (blue). 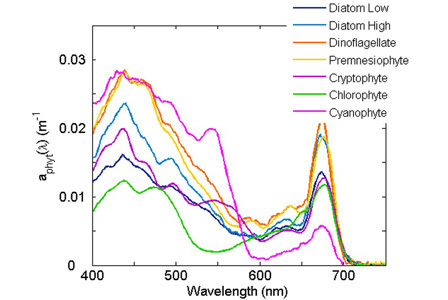 An example of absorption spectra for different monospecific phytoplankton cultures. Note the difference between diatoms grown at different light levels. Figure reproduced from Roesler (2013). 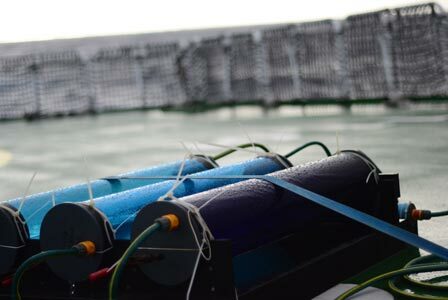 Filtration rig used to collect biogeochemical data that characterises the phytoplankton community structure. 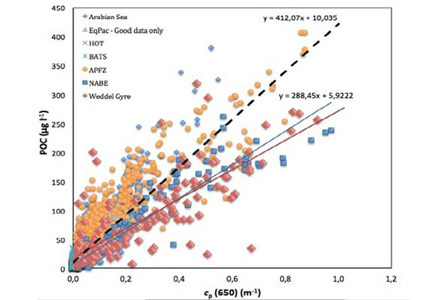 Regression of POC and cp (650 nm) for the Weddel Gyre (red line) compared with a global dataset from six different surveys (black dotted line). Taken from Ceinwen Smith MSc Thesis. 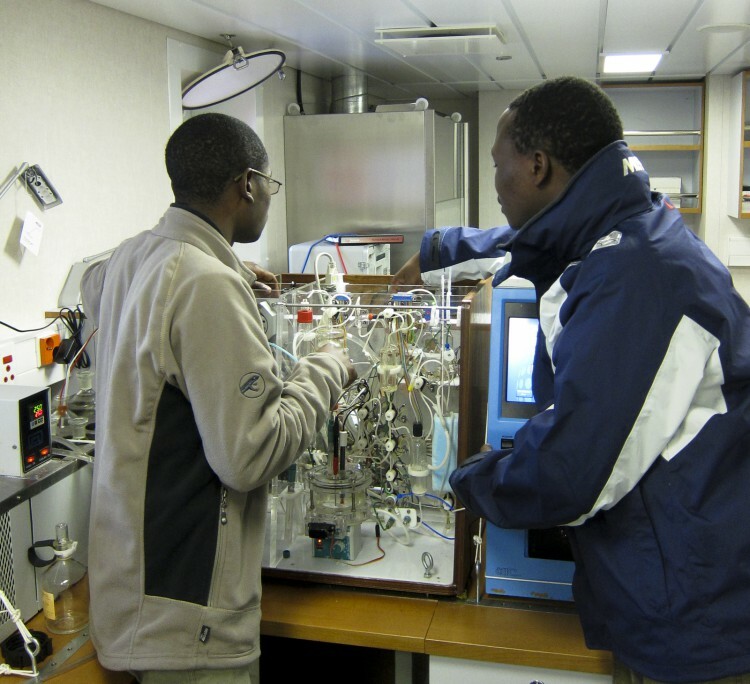 Scientists at work in the bio-optics and bio-geochemistry wet lab on the SA Agulhas II. A section of chlorophyll and particulate organic carbon across the Weddell Gyre in the Southern Ocean calculated from the optical properties of fluorescence and beam attenuation respectively. Taken from Ceinwen Smith MSc Thesis. 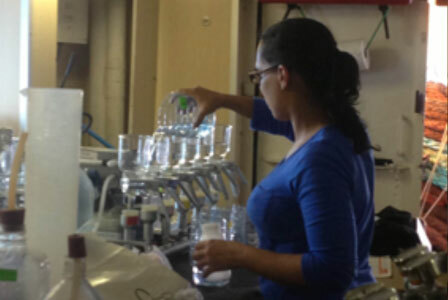 The biogeochemistry laboratory in the Oceanography department at UCT performs routine hydrographic measurements such as nutrient concentrations (NO3, NO2, NH4, SiO4, PO4, urea), dissolved oxygen, chlorophyll and pH. An automated system (flow injection auto-analyser) is available for NO3, SiO4 and PO4 analyses while NH4 is determined fluorometrically. All of the above nutrient concentrations can be determined manually using a colourimetric method. 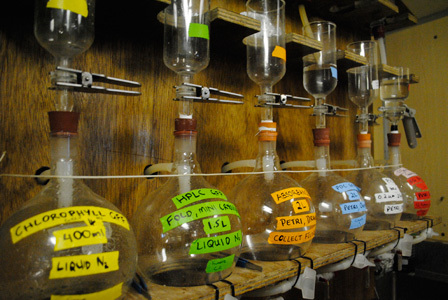 Filter stand used to filter seawater samples during nutrient cycling experiments. For the measurements of primary productivity and nutrient cycling rates, samples can be incubated in-situ instead of using incubators. 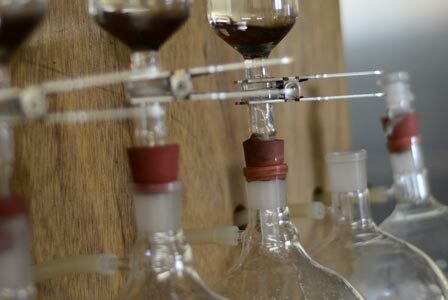 Incubators are used to replicate light levels from various depths and maintain a controlled temperature in order to estimate primary productivity and nitrogen cycling rates. 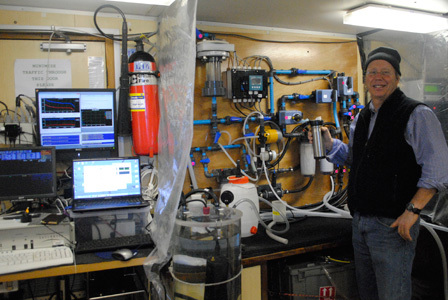 Incubators which have been set up on the SA Agulhas II during a research cruise in the Southern Ocean. Collection of samples for a nitrogen cycling study in St Helena Bay. In order to fully account for the atmosphere-ocean carbon exchange in the Southern Ocean, it has become increasingly important to resolve and understand the small-scale features of the upper ocean. One of the tools, SOCCO uses to understand the upper ocean and its exchanges are numerical ocean models. SOCCO uses the NEMO ocean modelling platform which includes interacting ocean, ice and biogeochemical models. The question of spatial scale on the upper ocean processes can be examined using a suite of models: ranging from global coarse-resolution (2º) to finer-scale regional ocean models (½, 1/12º) with the eventual goal to model a localised region of the Southern Ocean at very high resolution (1/36º), corresponding to the domain of the high-resolution in situ sampling campaign of SOSCEX . Using these model configurations, researchers and students are able to understand processes and compare them to observations. These may help account for the differences between observations and the models that are used in long-term climate prediction. 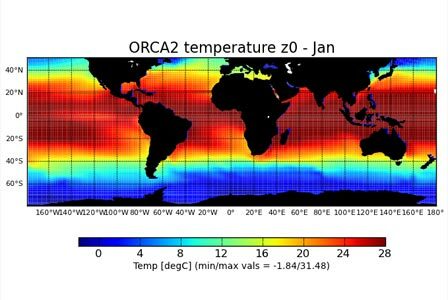 Global ocean-ice-biogeochemistry configuration ORCA2, January-mean SST. 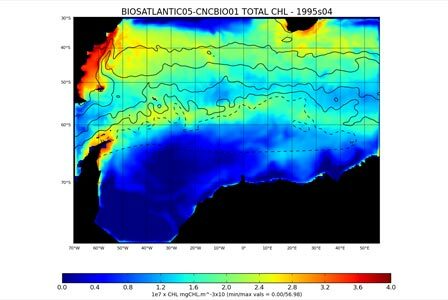 Total chlorophyll for the regional 0.5 degree ocean-ice-bigeochemistry model configuration (BIOSATLANTIC05). 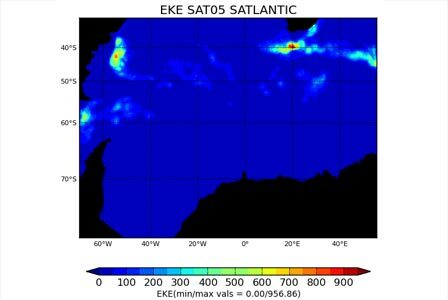 EKE for the regional 0.5 degree ocean-ice model configuration (SATLANTIC05). 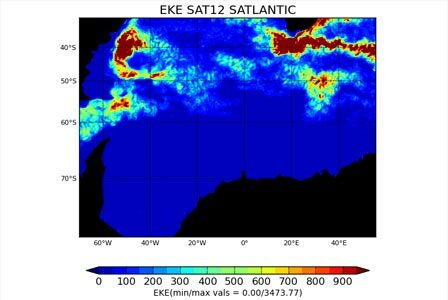 EKE for the regional 1/12 degree ocean-ice model configuration (SATLANTIC12). Ocean and atmospheric physical characteristics and dynamics are crucial to understanding key SOCCO related scientific focus areas where a multi-disciplinary approach is taken to understanding the links between climate, biogeochemistry and ecosystems. SOCCO researchers pursue research focused predominantly on submesoscale (<10km) to mesoscale (10-200km) oceanographic processes that have an impact on upper ocean mixing and stratification dynamics and variability. Core to this science includes understanding the link between the ocean and the atmosphere through air-sea exchange and interaction. Our work also extends to the deeper ocean processes and ventilation, while laterally to the larger scale circulation of the Southern Ocean from the Subtropical to Antarctic sea-ice domains. These approaches make South Africa a leading contributor to Southern Hemisphere ocean and climate science. SOCCO’s physics-related research is underpinned by an integrated approach, combining the use of numerical modelling simulations, ship-based observations and high-resolution measurements collected by autonomous ocean gliders and floats. 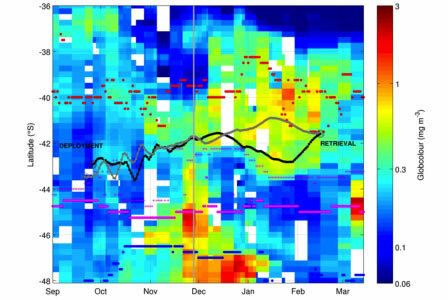 Recent emphasis has been placed on resolving the seasonal cycle of upper ocean physical processes in the Southern Ocean and relating this to biogeochemical responses. This was undertaken through unique experimental design by deploying marine robotic instruments in the Southern Ocean that continuously observe the ocean and air-sea exchange processes for extended periods of time (6 months) and resolving the temporal and spatial scales of variability at unprecedentedly high resolution. 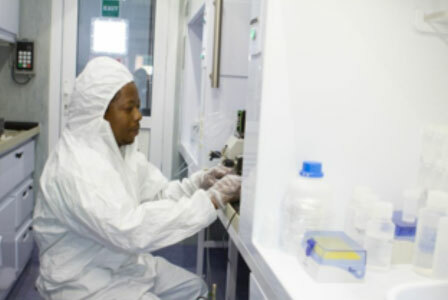 Our research contributes to South Africa’s developmental needs by using novel approaches in advanced observations, numerical modelling and analysis to train undergraduate and post graduate students. 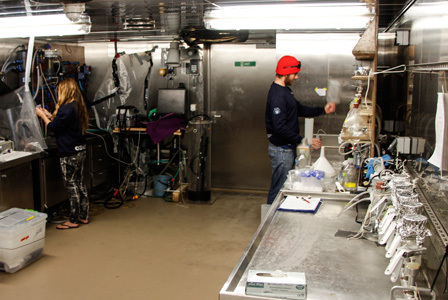 A CTD station being completed at the Antarctic ice shelf to investigate the diurnal and event scale variability of upper ocean physics and biogeochemistry in the ice impacted polar seas. SOCCO and South Africa’s geographical coverage of the Southern Hemisphere oceans and access to the Antarctic region. The coloured lines represent the domains covered by annual South African research and logistical voyages (carried out on the SA Agulhas II): Marion Island, Gough and Tristan du Cunha Islands, SANAE base, South Georgia Island and South Sandwich Islands. The blue lines represent the northern and southern extent of the Antarctic Circumpolar Current, while the magenta line represents the position of the Agulhas Current and Retroflection. The maximum winter sea-ice extent is indicated. The background shading represents the ocean depth. 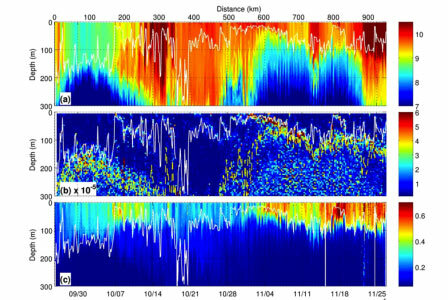 High-resolution time series of (a) temperature, (b) stratification and (c) chlorophyll-a collected by an ocean glider in the Subantarctic region. 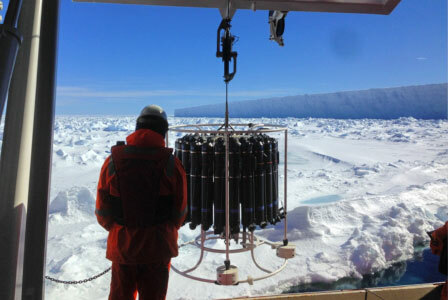 These observations provide a first look at the seasonal evolution of upper ocean physics and biogeochemistry in the Southern Ocean. 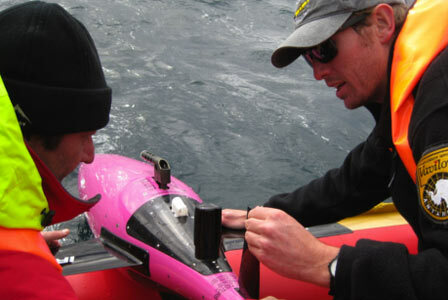 Profiling gliders are deployed in the coastal regions of South Africa and the Southern Ocean to observe key physical and biogeochemical properties of the water column.Compared to ships and moorings, these innovative and high-tech robots provide a cost-effective means to monitor the environment over extended paeriods of time. 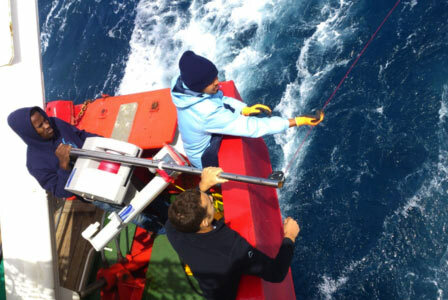 Deployment of a underway UCTD from the research ship, the SA Agulhas II. The underway mode profiling instrument collects temperature, salinity and pressure measurements up to 500m depth.UCTD deployments means we are able to collect sub surface water column measurements in underway mode without stopping the ship. 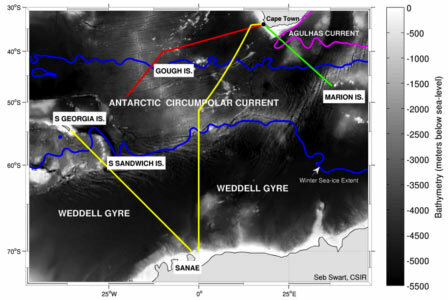 The Southern Ocean Seasonal Cycle Experiment (SOSCEx): Tow glider tracks overlaid onto the spring-summer surface chlorophyll-a concentrations, as measured from satellite. 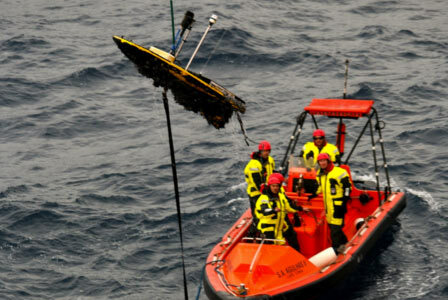 A Wave Glider is retrieved with a combined ship and small boat approach after spending numerous months sampling the Southerrn Ocean air-sea interface. These rare and valuable data are crucial to understanding the variability of the upper ocean currents and CO2 fluxes. Note the severe barnacle growth on thee underside of the glider’s surface float.